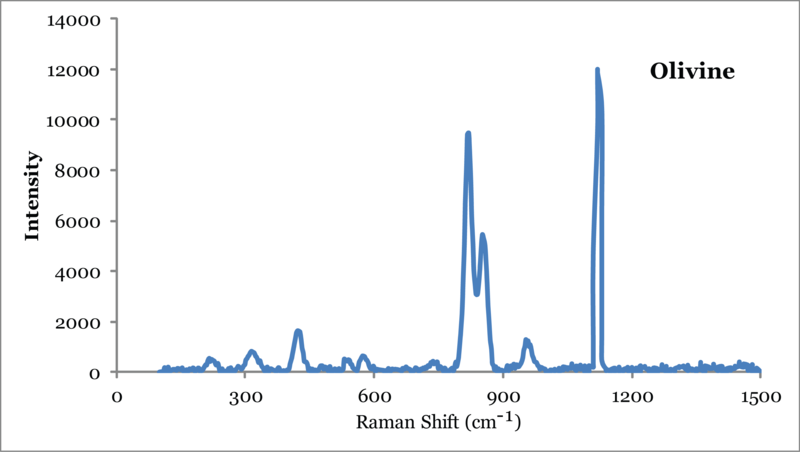 What does a Raman spectrum look like? Spectroscopy studies the interaction of radiated energy and matter. Different types of radiation can be used to study local structural environments of atoms in crystals, and therewith chemical and physical material properties. Various types of radiation differ in wavelength or frequency but are physically identical. When light interacts with a material, different processes can occur, reflection of light, transmission, scattering, absorption or fluorescence. All these processes take place when the incident radiation induces changes in energy levels, which can be of electronic, vibrational or nuclear nature. An example for the scattering process is the interaction of sunlight with the atmosphere: Sunlight consists of all the colors of the electromagnetic spectrum: red, orange, yellow, green, blue, and violet. Different colors of light have different energies or wavelengths. Red light has a long wavelength and a lower energy, whereas blue light has a short wavelength and a higher energy. When the sunlight passes through the atmosphere the gas molecules in the atmosphere scatter the sunlight, which is breaking up into its parts. However, they scatter the higher-energy blue wavelengths more effectively than the red wavelengths, so the sky looks blue. Energy differences between ground and excited energy levels cover a wide range of the electromagnetic spectrum from radio waves to gamma rays, a wide range of transitions, such as nuclear spin level transitions, vibrations of molecular groups or electron transitions. Depending on the application either energies, wavelengths, frequencies, or wavenumbers are used. The energy E (in kJ/mol or eV) is related to frequency ν or wavelength λ according to the equation E = hν = hc/λ, where h is the Planck constant (6.626 x 10-34 Js) and c is the speed of light in vacuum. Electromagnetic radiation can also be characterized by its wavelength λ with the base unit m, but typically expressed in µm or nm. The frequency ν describes the number of oscillations of the electric (or magnetic) radiation vector per unit of time. The typical unit is oscillations per second (s-1), or Hz. where cn is speed of light in medium, n is the refractive index of the medium. Wavenumber describes the number of waves per unit length and is very important for IR spectroscopy. It is expressed in cm-1. It is the inverse of the wavelength (1/λ) and is proportional to the frequency ν, with wavenumber = ν / c.
Quantum mechanics and different spectroscopic techniques developed extensively; typical energy source was electromagnetic radiation. Most of the crystals don't have an ideal crystal lattice, they are not perfect, but contain a certain number of lattice defects, which can be caused by e.g., temperature, pressure, crystal growth, radiation or phase transitions. When numerous defects affect macroscopic properties and chemical composition of minerals, and can be responsible for a variety of phenomena such as the generation of color, diffusion, deformation processes, crystal growth, electrical resistivity or the incorporation of trace elements. Spectroscopy can be used to study such defects in minerals. There are different types of defects, point, linear and planar, and radiation defects. Point defects are either single atoms or clusters of atoms, extending over a few atomic diameters. They can be divided into 1) missing atoms (vacancy), 2) interstitial atoms, 3) atoms in a wrong site, or 4) impurities. Some point defects are called 'centers', originating from F-center, the german word for 'Farbzentrum', which translates as color center. Such centers are anionic vacancies. The formation of a vacancy involves a local charge readjustment to maintain neutrality in the crystal. Hence, such vacancies are filled by charge-compensating electron(s) and cause colors of minerals. If a positive ion vacancy is compensated for by a negative ion vacancy such a pair is called Schottky defect. Alternatively a positive vacancy may be compensated by a positive interstitial nearby, which is named Frenkel defect. Another well-suited analysis technique to detect defects is transmission electron microscopy (TEM). Other types of defects are linear defects (e.g., dislocations) and planar defects (e.g., stacking faults), causing local distortions of the crystal structure, and radiation defects (observable as haloes), altering and destroying crystal structures. To describe defects and their reactions the so-called Kröger-Vink notation is used. A molecule consists of two or more atoms with certain distances between them through interaction of outer electrons. Distances are determined by sum of all forces between the atoms. When the molecule takes up energy atoms are excited to vibrate around their equilibrium state. The vibration energy is quantized, which means it can only have certain values described by quantum numbers. Radiation is emitted during the transition of molecule vibration from the excited state to a lower or the ground state. The frequency principle must be fulfilled, which says that the frequency of the incident light must equal the energy difference between electron orbits (molecule vibrations). If the incident energy is too low, rotations are excited, i.e. far IR region (below 200 cm-1) or microwaves for small molecules. The stretching frequency of a bond can be approximated by Hooke's law. 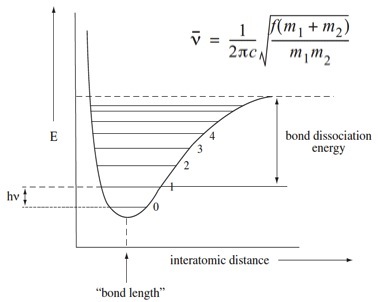 We can view a diatomic molecule as one-dimensional harmonic oscillator with the vibrating masses m1 and m2 on a weightless elastic spring (electrons are disregarded), which is characterized by the elastic force constant k. According to Hooke's law, the frequency of the vibration ν of the spring is related to the mass m and the force constant k of the spring. If the equilibrium state r0 is stretched by &Deltar, the sum of the spring displacement (x1+x2) a force F is active. The release of this force F induces vibration around the equilibrium state. In the classical harmonic oscillator the energy is calculated as follows: E= ½ k x2. This means, that the energy or frequency depends on the magnitude of spring stretch or compression. However, vibrational motion is quantized as mentioned earlier and only vibrations which satisfy following formula are allowed: E = (n+1/2) hν, with n = quantum number (0, 1, 2, 3,...) and ν the frequency of the vibration. The lowest energy level is ½ hv the next highest is 3/2 hν. This means that only transitions to the next energy level are allowed. The molecules will absorb an energy amount equal to 3/2 hν – ½ hν, or hν. However, the molecule actually behaves as an anharmonic oscillator, which is due to the fact that a bond can not infinitely be compressed or stretched, it can break. As interatomic distances increase the energy reaches a maximum, the energy levels are not equidistant anymore like in the case of a harmonic oscillator. Allowed transitions become smaller in energy. Sometimes higher transitions can be observed, which are called overtones. Overtones have a lower intensity than the fundamental vibration. The wavenumber in the case of the anharmonic oscillator can be calculated as shown in the image, where ν is the frequency in cm-1, m1 and m2 are the masses of the atom in g and c is the speed of light in cm/s. This equation describes the relationship of bond strength and mass to the wavenumber. It incorporates the reduced mass µ = m1m2/m1+m2. As the force constant increases, the wavenumber increases. As the mass of the atoms increases, wavenumber decreases. Vibrational modes can be divided into stretching (symmetric and asymmetric) and bending vibrations (in-plane and out-of plane). The selection rule says, that vibrations are only IR active (or allowed), if the molecular dipole moment changes during the vibration. A diatomic molecule with the same atoms cannot be excited to vibrate because no dipole moment is present. In contrast, molecules with various types of atoms can interact with incident radiation, and even if a dipole moment is not present in the beginning it can be induced due to antisymmetric displacement of the center of charge (e.g., CO2). A molecule of n atoms has 3 N degrees of freedom. In a non-linear molecule 3 of these are rotational and 3 of these degrees are translational, and the remaining belong to fundamental vibrations (normal modes). In a linear molecule 2 degrees are rotational and 3 degrees are translational. The number of fundamental vibrations in a non-linear molecule is therefore 3N-6 and in a linear molecule it is 3N-5. The water molecule is an example for a non-linear molecule and has 3 fundamental vibrations (3 x 3 - 6). The CO2 molecule is an example for a linear molecule and has 4 fundamental vibrations (3 x 3 - 5). Overtone bands: due to transitions of 2hν, 3hν, etc., lower intensity than the fundamental vibration band. Band position is at a slightly smaller frequency than the multitude of the fundamental vibrational frequency. The typical setup of an IR experiment includes a light source, a sample, (a microscope), the spectral apparatus, a detector and a computer. A light source emits polychromatic IR light, which is focused on a sample. The light is partially absorbed by the sample when it is passing through it. Molecules in the sample interact with the light, they take up energy and use this energy to vibrate, with the condition that the dipole moment changes. A detector registers how much light is transmitted through the sample. The result is a characteristic spectrum showing the transmittance (absorbance) of electromagnetic radiation as function of wavelength (wavenumber). The most frequently used light source is the Globar, which is silicon carbide in form of rods or helixes. A globar can be directly ignited, and has a burning temperature of 1500 K, which needs to be water-cooled. The globar has the advantage of a relatively high emissivity to about 100 cm-1, so it can be used into the far IR region. Another source is the Nernst rod, which works at a temperature of 1900 K and is used for the MIR region. It consists of zirconium oxide rods with additives of yttrium oxides or oxides of other REE. 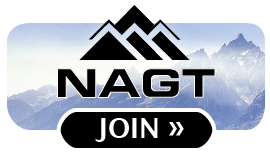 The Nernst rod is a non-conductor at room temperature, initial heating is required for ignition. It has following disadvantages: sensitive, deforms easily, oxide mix has negative temperature coefficient of the electrical resistance, i.e. electrical conductivity increases with temperature. Metallic helices, i.e., chromium nickel alloys or tungsten with operating temperatures of about 1300K, are usually air-cooled and used in NIR. For NIR you can also use tungsten-halogen lamps. For FIR, below 100 cm-1, you can use mercury high-pressure lamps. It's plasma emission surpasses the spectral radiation power of a black radiator of the same temperature. They must be started by a high-voltage pulse. Lasers can be used as radiation sources, too. Gas lasers scan rather narrow spectral regions (CO2 laser 1100 - 900 cm-1, CO laser 2000-1800 cm-1, NO2 laser 900-910 cm-1, He-Ne laser (632, 1.152 and 3.391 µm)). Semi-conductor diode lasers are larger tunable, and can cover almost the whole MIR region, e.g., PbSnSe-type lasers. A disadvantage is their low operation temperature of 15 - 90 K. Other examples, such as the gallium arsenide -, or gallium aluminium arsenide lasers work in the IR region, and can be operated at room temperature. Infrared microscopes use reflecting optics such as Cassegrain objectives with 15fold or 36 fold magnification instead of glass or quartz. Using a microscope makes it possible to select a distinct measurement area on the sample and exclude contaminations from the measurement. There are various types of spectrometers, non-dispersive (no variable wavelength selection possible), dispersive (variable wavelength selection using gratings or series of filters) and Fourier Transform (FT) spectrometers (spectral splitting via interferometer allows wavelength-dependent radiaton modulation). The optical system in a spectrometer is used to transmit radiation to the detector. Lens systems of glass or quartz as used in UV and VIS range are useless in the IR range, because they absorb most of the radiation below 5000 cm-1. Thus, IR spectrometers are equipped with mirror optics. Dispersive spectrometers consist of a monochromator splitting radiation into its parts, which then separately exit to the detector by turning the grating or mirrors. With the Echelle grating earlier problems of low light intensity were overcome by using specially formed grooves (in metal or glass). The main part of a FT spectrometer is the Michelson interferometer, in which the radiation is split by a semi-permeable beamsplitter into two partial beams that are reflected back to the beamsplitter via a fixed and a movable mirror. At the beamsplitter the two beams recombine and are brought to interfere. The motion of the movable mirror changes the optical pathlength, so both partial beams have a phase difference and the interference amplitude is changing. The detector registers an intensity signal as function of the change of the optical pathlength, which is then transformed into an interferogram. Spectral resolution is defined by the distance between two neighboring absorption maxima having about the same height, which are separated by an absorption minimum, the transmittance of which is approximately 20 % higher than the band maxima. Detectors convert the optical signal into electrical signals. There's a variety of different types, such as thermal, pneumatic, pyroelectric or photoelectric detectors. Nowadays most detectors are photoelectric detectors because of their higher sensitivity. Incident light alters the electrical conductivity in an irradiated semiconductor material. The photosignal is measured as a change in voltage via the resistance or current. Polarized measurements can be very useful for the analysis of oriented minerals with IR spectroscopy. Polarized radiation is produced with a polarizer consisting of a fine grating with parallel metal wires. In oriented crystals certain dipole moment changes lie in a fixed direction during the molecular vibration and can be excited when the IR radiation is also polarized in this direction. The efficiency of a polarizer depends on its grid spacing and optical throughput. Common materials are ZnSe (MIR), KRS-5 (MIR), Ge (MIR, highest efficiency with 90% throughput), polyethylene (FIR), polyester (FIR), CaF2 (NIR). KBr pellets can can be used as sample holders or to dilute sample material. They can be purchased (e.g., most common 13 mm in diameter) or produced with a pressing tool. KBr is permeable to 400 cm-1. However, KBR is hygroscopic, so it should be dried at 150 ºC and afterwards stored in an exsicator. Other usable materials are for example NaCl (to 650 cm-1), KI and CsI (to 200 cm-1). Pellet production: Alkali halogenides are able to cold-flow at pressures of ~ 0.7 – 1 GPa, the material singers and transparent tablets can be formed. To produce a tablet in general 0.5 to 1.5 mg sample material is finely ground in an agate mortar; about 300 mg KBr powder are added and carefully mixed. The mixture is placed into the press mould, the upper stamp precompresses the powder, which becomes equally distributed. The pressing tool is inserted into a hydraulic press (with vacuum pump). The assembly is exposed to 0.75 GPa (105 N) and the end pressure is held for 2-10 minutes. Alternatively, one can prepare solutions, or oil suspensions, apply a layer or film on a sample holder, or use the ATR method for insoluble materials. Single-crystals, which are measured under the microscope, should have a double-sided polish. The quality of the single-crystal preparation is especially important for quantitative studies, in which the sample thickness is a parameter. Depending on the measured species concentration you might have to thin the sample down to avoid saturation of peaks. Additionally, samples can be placed into diamond-anvil cells or heating-cooling stages, to obtain pressure- or temperature-dependent spectra, which might deliver useful additional information. Phase changes can occur, fine structure can become observable, bands can split or shift, or in general a better spectral resolution might be obtained. Attenuated total reflectance (ATR) is a useful technique to obtain the IR spectrum of the surface of a material, which is too thick or too strongly absorbing to be analyzed by standard transmission methods. ATR is insensitive to sample thickness, the effective penetration depth is a fraction of a wavelength. 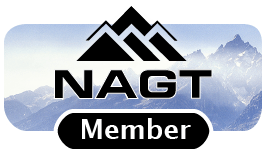 Sample materials can be powders, pastes, fibers, paper, foams, textiles or soils. The sample is placed in contact with an internal reflection element, a material with a high refractive index, e.g. ZnSe, Ge or Si, or diamond. The light is totally reflected, several times, and the sample interacts with the evanescent wave resulting in the absorption of radiation at each point of reflection. The intensity of the evanescent wave decays exponentially with the distance from the surface of the internal reflection element. Light with longer wavelength penetrates deeper into the sample, which results in stronger bands. The angle of incidence is usually chosen to be between 45 and 60 º (a smaller angle results in deeper penetration than a higher angle). Sensitivity of ATR instrument depends of physical contact between the crystal (internal reflection element) and the sample. Diffuse reflectance is often used for powders, soils or solids having a rough surface. The diffuse scattered radiation is collected in a wide spatial angle. One fraction of radiation is mirror reflected from uneven areas of the surface, the other part of radiation penetrates the sample, is partially absorbed and returns to the surface via scattering. The optical properties of the sample depend on the absorption and scattering coefficients. After integration of the fundamental differential equation one obtains the degree of reflection on the sample surface at infinite thickness. One can calculate a spectral function that is proportional to the normal absorbance spectra. Spectra acquisition conditions depend on sample particle size, packing density and homogeneity. Advantages of Raman spectroscopy are its non-destructive nature, small sample amounts can be studied and no sample preparation is necessary. At temperatures higher than absolute zero all matter vibrates. A molecule can be transferred to an excited state (vibration) through the absorption of a photon. The energy has to be equal to the energy difference between the two vibrational states (see IR spectroscopy - frequency principle). However, in Raman spectroscopy UV, VIS or NIR light is used as radiation source, which has a much higher energy than those energy differences and absorption of photons is impossible. Instead the incident light will excite the system to a high-energy state. When it recovers from this state (immediately), scattering reactions occur. The elastically scattered light has the same energy as the incident light - Rayleigh scattering. If the system gains energy during this process, the scattered light loses this amount of energy and the system reaches a higher energy state (higher energy level) than it had before - Stokes scattering. Of an already vibrating system is excited, it loses energy during this process and the system reaches a lower energy level than it had before - Anti-Stokes scattering. The latter process is much more rare, since at room temperature most molecules are in the ground state as opposed to a higher energy level. The polarizability is a measure for the electron cloud's ability to deform in contrast to the atomic nuclei. When placed into an electric (or oscillating) field the electrons are pulled towards the positive charge and the atomic nuclei towards the negative charge, which induces a dipole moment and results in scattering reactions. The change of the polarizablity depends on the molecule geometry. For example, during the symmetric stretching vibration of the linear CO2 molecule the polarizablitiy gets smaller during the stretching as opposed to the compression. It changes, and the vibration is Raman-active (but IR-inactive). During the asymmetric stretching vibration on the other hand the polarizability does not change, and the vibration is Raman-inactive (but IR-active). A Raman spectrum plots light intensity (unit, e.g., counts, counts per second or arbitrary units) versus light frequency (relative wavenumbers). A Raman spectrum consists of three parts, the intense Rayleigh line and less intense Raman bands in the Stokes (red shifted, low-energy) and Anti-Stokes (blue shifted, high-energy) parts of the spectrum, whereby the latter two parts are equal in energy. Generally, only the Stokes bands are recorded, because they are more easily detectable due to their higher intensity. The Rayleigh line equals 0 Raman shift, so that Anti-Stokes lines have negative wavenumbers and Stokes lines have positive wavenumbers. The wavenumber shift is characteristic for a material. The main components of a Raman system are a 1) light source, 2) optical components, such as lenses and mirrors, to focus the light onto a sample and collect the scattered light, 3) a spectrometer, and 4) a detector. The light source is typically a UV, VIS, or NIR laser emitting monochromatic light. Types of lasers are gas lasers (e.g., Ar+, diode-pumped solid state lasers, or tunable lasers. Notch filters are used to filter the Rayleigh line intensity before the scattered light is entering the spectrometer and the detector (CCD camera). In the majority of experiments dispersive spectrometers are used (see IR section for details) in combination with back-scatter, forward scatter or 90º geometries. Depending on the instrumental setup, spectral resolutions of ~ 0.05 cm-1, depth resolutions of about 2 µm and effective lateral resolutions of 1 – 1.5 µm can be reached. 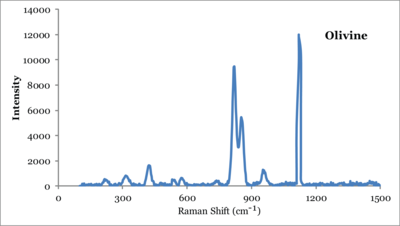 Raman microspectroscopy often takes advantage of a confocal setup to increase the spectral resolution, where two apertures (behind the light source and before the spectrometer) reduce stray light and eliminate out-of focus information and only information from the focal plane reaches the detector. McMillian, P.F. and Hofmeister, A. (1988) Infrared and Raman spectroscopy. In: Hawthorne (Ed.) 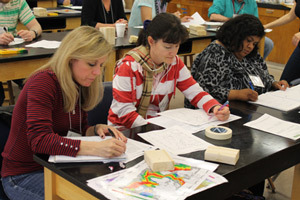 Spectroscopic Methods in Mineralogy and Geology. Reviews in Mineralogy, 18, 99-159. Beran, A. and Libowitzky, E. (2004) Spectroscopic methods in mineralogy. EMU notes in mineralogy, 6, Eötvös University Press, 661 p.
Keppler, H. and Smyth, J.R. (2006) Water in nominally anhydrous minerals. Reviews in Mineralogy and Geochemistry, 62, 478 p.
1) Herschel, W. (1800), Philos. Trans. MDCCC, 284. 2) Lehrer, E.Z. (1942) Techn. Phys., 23, 169. 3) Smekal, A. (1923) The quantum theory of dispersion, Naturwissenschaften, 11, 873. 4) Compton, A. (1923) A quantum theory of the scattering of X-rays by light elements, Phys. Rev., 21, 483. 5) Raman, C.V. and Krishnan, K.S. (1928)The optical analog of the Compton effect. Nature, 121, 711. 6) Landsberg, G. and Mandelstam, L. (1928) A novel effect of light scattering in crystals, Naturwissenschaften, 16, 557. 7) Raman, C.V. and Krishnan, K.S. (1929) The production of new radiations by light scattering, Proc. Roy. Soc. (London), 122, 23. 8) Jones, R.N. (1987) Analytical applications of vibrational spectroscopy - A historical review. European Spectroscopy News, 72, 10. 9) Sutton, M. (2009) Twinkle, twinkle little star - History of spectroscopy. Chemistry World, 6, no. 12, 50-53. 10) Thomas, N.C. (1991) The early history of spectroscopy. Journal of Chemical Education, 68, no. 8, 631-634. 1) Cheetham, A.K. and Day, P. (1987) Solid State Chemistry – Techniques. Clarendon Press, Oxford, Chapter 9. 2) Farmer, V. C. (1974) The infrared spectra of minerals, Mineralogical Society of London, Monograph, no. 4. 3) Kendall, D.N. (1966) Applied Infrared Spectroscopy. Reinhold Publishing Corporation. 5) Nakamoto, K. (1986) Infrared and Raman spectra of inorganic and coordination compounds. Wiley, New York.